For information about the Cedar Shake roofing products Keith Green Construction offers please contact us at 503-681-7912 or browse the Sustainable Roofing section for more information on high quality rubber roofing products that look like traditional Cedar Shake roofing. Composite roofing shingles are covered with a layer of weather-resistant mineral granules that act as UV protection for the underlying asphalt or fiberglass product. If the granule coating comes off failure of the roof is imminent as the harmful rays of the sun dry, crack and peel the remaining product on the roof. This roof is in danger of that process. Notice the layer of granules in the rain gutter. 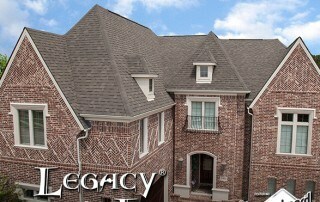 This roof is actually a 30 year product, but at the time of this picture the product is only 7 years old. This product failure was caused by poor or improper attic ventilation. Professional installation by trained composite roofing professionals with the ability to foresee the unique challenges of your individual roof project is imperative for maximum roof life. What’s in your rain gutter? Keith Green Construction has beautifully designed metal roofing that resemble wood shake, tile or slate. Find out more about our metal roof repair & installation services. To find out more about our Portland cedar shake and composite roofing options, please contact us today.